TS Ed.CET 2019 Notification, Schedule | Telangaana EdCET 2019, #TS Ed.CET 2019 Notification, Schedule: Telangana State Government, TSCHE and Osmania University #EdCET officials will issue the Bachelor of education Common Entrance Test 2019 (Ed.CET-2019) in the month of February, 2019. This entrance test for entry into 2 (Two) year Bachelor of education(B.Ed) Regular Course in the Colleges of Education in Telangana State for the academic year 2019-2020. టీఎస్‌ ఎడ్‌సెట్‌ షెడ్యూల్‌ విడుదలైంది. తెలంగాణ ఉన్నత విద్యామండలి చైర్మన్ ప్రొ. పాపిరెడ్డి దీనికి సంబంధించిన నోటిఫికేషన్ ను విడుదల చేశారు. ఈ నెల 25న ఎడ్‌సెట్‌ నోటిఫికేషన్‌ విడుదల కానుంది. ఈ నెల 28 నుంచి ఏప్రిల్‌ 20 వరకు ఆన్‌లైన్‌ దరఖాస్తులను ఆన్‌లైన్‌లో స్వీకరిస్తారు. ఆలస్య రుసుముతో మే 4 వరకు దరఖాస్తు చేసుకునే అవకాశం ఉంటుంది. మే 31న ఎడ్‌సెట్‌ పరీక్షను నిర్వహించనున్నారు. జూన్‌ 15న పరీక్షకు సంబంధించిన ఫలితాలు విడుదల కానున్నాయి. The University would invite the Online Applications from eligible Candidates for admission into 2(Two) B.Ed course offered by state Universities in Telangana State including their Affiliated Colleges. The Osmania University will be conducting TS Ed.CET 2019 on May 31 for admission into B.Ed. (Two Years) regular course in the Colleges of Education in Telangana State for the academic year 2019-2020. The notification for the same would be issued on The last date for registration is April 10 and with late fee of Rs. 500 is May 04 ... Eligible candidates have been asked to submit their applications online mode only. Application registration fee of Rs. 650/- (Rs.450/- for SC/ ST) should be paid at TS Online/AP Online/Mee-Seva/E-Seva Centres in Telangana State or A.P/ through Payment Gateway. For details, the candidates may visit the website edcet.tsche.ac.in. Candidates satisfying the following requirements shall be eligible to appear for Ed.CET-2019. (i) The Candidates should be Indian Nationals. (ii) The Candidates should satisfy Local/Non-Local status requirements as laid down in the Andhra Pradesh Educational Institutions (Regulation of Admission) Order 1974 as subsequently amended. Candidates should have passed/appearing for final year examinations of B.A./B.Sc./B.Sc. (Home Science)/B.Com./ B.C.A./B.B.M. at the time of submitting the Application for Ed.CET-2019. Candidates should be required to produce marks memo and pass certificate at the time of admission. Candidates should have secured a minimum of 50% marks either in the Bachelors Degree i.e. B.A./B.Sc./B.Sc. (Home Science)/B.Com./B.C.A./B.B.M and or in the Masters Degree in relevant subject or 5years integrated course in the relevant subject of methodology or any other qualification equivalent thereto. However the candidates belonging to all other reserved categories i.e. S.C., S.T., B.C. (A/B/C/D/E), and Physically handicapped should have secured a minimum of 40% marks in the qualifying examination. This time Engineering Students are also eligible for Ed CET. So, the candidates who passed B.E/B.Tech professional courses are eligible for admission into B.Ed course. Note: As per the GOMS No: 92, the candidates who passed B.E/B.Tech, M.B.B.S /B.D.S /B.A.M.S. /B.L /L.L.B /B.A. (Languages)/B.O.L etc. and other such professional courses are not eligible for admission into B.Ed course. The candidates should have completed the age of 19 years on 1st July of the year in which notification is issued. There shall be no maximum age limit. 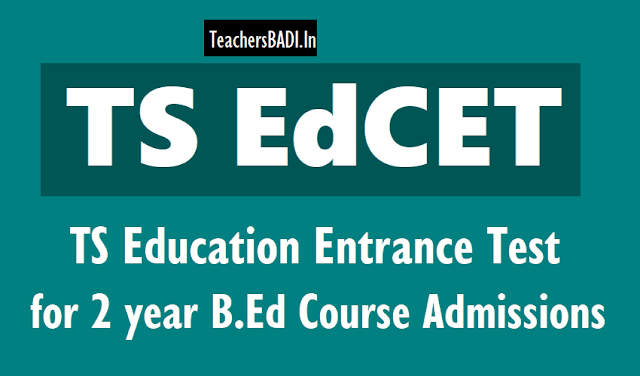 The TS EdCET is held for admissions in two-year BEd course in various colleges across the State. The online registration for Telangana State Education Common Entrance Test has begun and last date to apply through the website edcet.tsche.ac.in is April ... Candidates can also apply with a late fee of Rs.500 till May ... The registration fee for SC/ST candidates is Rs.450 and for others it is Rs.650. Candidates can correct online application data already submitted. Hall tickets can be downloaded from the website. The entrance test will be held in 14 test centres across the State from 11 a.m. to 1 p.m. on May .., June ... After, a preliminary key will be released and candidates send objections on preliminary key. The results will be declared tentatively on June 11. The TS EdCET is held for admissions in two-year BEd course in various colleges across the State. Eligible Candidates may submit their applications through online mode only. Application registration and processing fee of Rs.650/-(Rs.450/- for SC/ST) may be paid at AP Online / mee-seva / e-seva Centers in Andhra and Telangana region / through Payment gateway(Credit card/ Debit card).